We’re very pleased to announce that not one, but two new Rideau books will be available this summer, authored by two of the directors of Friends of the Rideau, Ed Bebee and Ken Watson. Each takes at look at different facets of the history of the Rideau Canal. Ed’s new book, Invisible Army, is the fascinating story of the staff of the Rideau Canal, the people that made and continue to make the canal work, from 1832 to present. Ken’s new book, Tales of the Rideau, brings together some of the well known and many lesser known factual stories of the Rideau. “Invisible Army” is the story of the forgotten people who made the Canal work – they stayed on through the tough times after the canal opened in 1832 and Col. By left. This new book celebrates their dedication over the past 175+ years. 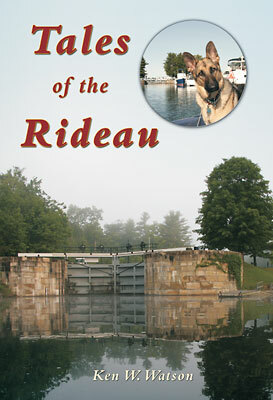 It’s coming soon to a bookstore near you and will always be available on the web at www.rideaufriends.com. The overarching focus is on the lockmasters and lock men, as well as “the rest of the troops” – the carpenters, divers, masons and blacksmiths – the men and women who worked on the tugs, dredges and scows. There are lists of the lockmasters, lock staff and bridgekeepers – station by station – 1832 to the present. Most books about the Rideau grudgingly include only people like Lt. Col. By and mention the initial construction crews – the wood, masonry and natural landscapes are their real concern. Rideau heritage is so much more. Let me know what you think and if you know of people I missed, give me a shout. If I’m wrong about something, point it out (with some backup for your position, of course). The first tale that I heard when I arrived on the Rideau, the Lost Barrel of Silver, leads off the book, one of 17 “tales” recounted in the book. That story, of a lost barrel of silver coins in Opinicon Lake, intrigued me. Later I was to read or hear many variants on that tale from locations up and down the Rideau. My main interest is in the truth behind the tale. Could the story of the lost barrel of silver be true? The answer is yes and in the book I explain why. I’ve included other “classics” - such as the tale of Oliver’s Ferry, the Last Duel in Perth and the Ghost of Watson’s Mill. In addition to the Rideau classics are several lesser known stories, some of which have been printed in part in this newsletter. Those tales include the Blue Edged Bowls, the Sluiced Superintendent and the Death on the Rideau story from the last newsletter. Others in this category include the story of why the dam at Hogs Back fell down three times during construction; why, in 1869, the gates failed at Jones Falls killing two men; how a 700 pound rock ripped through contractor Robert Drummond’s house at Jones Falls in 1831; and what caused the rush of water that almost took out Upper Brewers lockstation in 1832. Some stories started with just an interesting thought. For instance, I found it a remarkable coincidence that, on May 25, 1832, the day Colonel By was passing through Smiths Falls on his first triumphant cruise through the Rideau, a clerk in London, England was, at that very moment, penning the instrument of By’s demise, a Treasury Minute, requesting that By be relieved of command and return to England to face Parliament. So that leads into the story of how Colonel By got into trouble with Parliament (that tale even contains an exploding cannon). When I was kayaking last year with a friend, the topic turned to malaria and he asked a simple question: “where did it come from to get into the Rideau construction camps?” I’ve written about malaria on the Rideau before, but for this book, I’ve done a different take on the topic - starting with where it came from. And the last (and longest) story is about how the Rideau was mapped (the tale of the surveyors). While factually based, I think that the presentation will have a broad appeal and help make the public more aware that our Rideau is a very interesting place. Oh, and why is there a puzzled looking dog on the front cover of the book? That’s my dog in front of Narrows Lockstation wondering why there is a lock in the middle of a lake (one of the tales). Unfortunately for my dog, while I’ve tried to present that story with clarity in the book, it still won’t help her understand why Narrows Lock is where it is, since she can’t read. 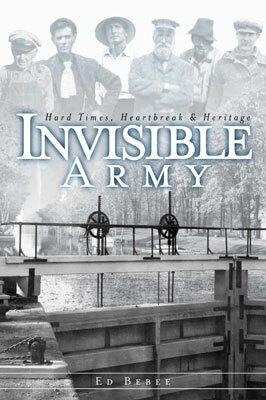 Invisible Army and Tales of the Rideau should be available sometime in June, keep your eye on our website for details. Our annual spring meeting will be held on May 8 in Merrickville. It will be at the Royal Canadian Legion Hall (same place as last year) - you’ll find a map on the back page showing the exact location. We are pleased to feature a talk by our very own Brian Osborne, Professor Emeritus at Queen’s University (and speaker extraordinaire). Brian will be looking at the Rideau Canal since it became a World Heritage Site in 2007 — looking at developments both locally and in a global context. Heritage is a dynamic concept and its effective management is a constant challenge. This presentation will look back over the last three years of issues and developments affecting policy and practice throughout the Rideau Corridor. So, come out, enjoy the talk and meet some Friends. “Friends of the Rideau is a volunteer, non-profit organization working in partnership with Parks Canada to enhance and conserve the heritage and charm of the Rideau Canal Corridor. Our interest in the re-development of Lansdowne Park stems from our concern that the heritage character of the Rideau Canal, a National Historic Site and UNESCO World Heritage Site, be maintained consistent with the criteria used to obtain these designations for the Canal. It is quite clear to us that you, the members of the design panel, are very conscious of the significance of the Lansdowne Park site in the history and cultural landscape of the City of Ottawa. This concern became part and parcel of the World Heritage Committee decision on the designation of the Rideau Canal in 2007. We should not forget that Canada must report back to UNESCO by the end of 2012 on the measures being taken to protect the visual values of the Rideau Canal, and that World Heritage Site designation is not granted in perpetuity but can be re-visited if the features and characteristics proposed in the original nomination are changed or threatened. The challenge before you is to make better use of the site while avoiding a clash with the more or less traditional character of the canal “shoreline”. How to protect the qualitative, almost ephemeral aspect of visual qualities and setting? How to make visitors consciously notice the setting/landscape and understand its heritage significance? How to create sustainable public value in the Lansdowne Park space? We hope that, as the Lansdowne Park design competition proceeds, the drivers of change in this particular context can be reconciled with the importance of preserving a key part of Ottawa’s – and Canada’s – heritage, while allowing the evolution of the landscape in a sympathetic way. Parks Canada continues to maintain their cone of silence regarding the Rideau Corridor Landscape Strategy. We haven’t heard a word since the last newsletter. In order to achieve meaningful progress, a visual values study and open public dialog will have to be initiated no later than this summer. We’ll see. One of the perks of running a large website about the Rideau Canal is that I get some very interesting emails. One such recently arrived from a fellow from Ohio. He had picked up seven watercolour paintings at a local “tag sale” (type of garage sale). In the rush with the crowds, he’d only noticed that these watercolours looked old and were tagged with a very good price, so he quickly bought them. It was only later, when he had them home, that he took a close look at them. They were canal scenes, and on the back of one painting, in very faded writing, were the words “Hog’s Back.” An Internet search on that term led him to my website and then an email to me. What this fellow purchased were watercolours, most likely done by John Burrows, one of the Overseers of Works for the Rideau Canal. The paintings date to between 1835 and 1845 and they have a very interesting story behind them as well as a bit of a mystery. The first bit of the mystery is who really painted them. These aren’t the only copies of these paintings, in fact, with this “new” set, I now know of at least 4 copies. One set (19 paintings) is held by the Archives of Ontario. They are attributed to William T. Clegg, although they note that Burrows was likely involved in the original painting. Two (possibly 3) sets are held by Library and Archives Canada (at least 37 paintings, several are duplicates) - one set is attributed to John Burrows and another set to Burrows with later additions by William T. Clegg. Why the confusion? William T. Clegg was the Clerk of Cheque (chief accountant) - he served from 1826 to about 1845. John Burrows, a surveyor, was one of the Overseers of Works, hired in 1826 and serving until sometime in the 1840s (he died in 1848). We know that Burrows was a painter (as was the other Overseer of Works, Thomas Burrowes). But was William T. Clegg also a painter? Part of the mystery is that we have several versions of these paintings. The way to make a direct copy of a painting back in those days, was to paint a copy. This is evident in the various copies, they are very similar but not identical. One suggestion for the reason there are multiple copies of the same paintings is they were prepared to document the construction of the canal for presentation to visiting officials. 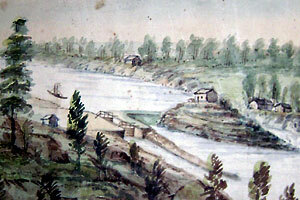 The Archives of Ontario concluded that while the originals were probably done by John Burrows, later copies were made by William Clegg (copying both the content and style of the Burrows paintings). Who had these particular paintings? They were owned by a lady (now deceased) with the maiden name of Burrows. Was she related to John Burrows? Possibly - we know that many Rideau paintings were (are) in private hands, often relatives of the painter. For instance, the Thomas Burrowes paintings were found in an attic of a Burrowes’ relative in Detroit in 1907 and ended up in the hands of Burrowes’ grandson, A.D.H. Ross, who gave (or sold) them to the Archives of Ontario in 1948. There is no provenance info for the Burrows paintings that they hold attributed to William Clegg. These paintings provide a wonderful insight into the early Rideau Canal (since it pre-dated the invention of photography). There are some errors (such as showing 3 locks at Upper Brewers), but in general they provide good historical information. The Burrows/Clegg set is complete, but we’re still missing several of the Thomas Burrowes paintings (Hartwells and the entire section from Burritts Rapids to Poonamalie inclusive). So, keep your eye out at your local garage sale - you never know what might turn up. 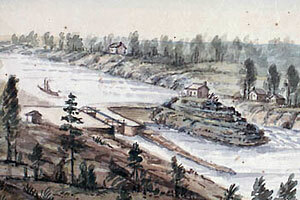 The Rideau has a rich milling history; saw, grist and carding mills helped develop and shape this region. Two outstanding examples of mills are celebrating milestones this year. Watson’s Mill in Manotick turns 150 and the Old Stone Mill in Delta is turning 200. Take some time for an enjoyable outing and pay a visit to these beautiful mills this summer. And, keep your eye out this summer for big paddling improvements along the Rideau itself (unfortunately we can’t say more at this time).